Spring in New England doesn't always feel like spring. Every now and then, you'll get a glorious, 70-degree day. But, in New England, spring is more about waiting for those days than actually experiencing them. Today was one of the waiting days. It was barely 60 degrees when I got home from work, and it had just started to rain...hard. The smell of rye bread toasting when I walked through the door was welcome. I knew right away that Kurt had started our dinner, a recipe from Sundays at Moosewood, Cauliflower Rye Casserole. This recipe is comfort food at its best. 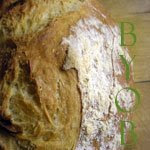 The smell of the rye and caraway fill the whole house. The oven stays on throughout the entire preparation, sending gentle heat throughout the kitchen. The dish itself is cheesy and gooey and warms right to the soul. With the number of new recipes that I try every month, it is rare for one to stand out so much that it becomes an instant classic in the house. The Cauliflower Rye Casserole did just that. Since making it for the first time in February, we've made it at least another three times. The ingredients sound strange, but, put together, they are the perfect blend. If this recipe hadn't come from the Moosewood Collective, I probably wouldn't have trusted it. However, my experience with Moosewood has been to just go with it, because they know what they are doing. Pour the beer and stir and let sit until it becomes flat. Put bread cubes on baking sheet, and toast in a 300-degree oven until they are crisp, but not browned, about 15 to 20 minutes. When cubes come out of oven, turn oven up to 350 degrees. Saute the cauliflower in the butter with the caraway seeds until just barely tender. 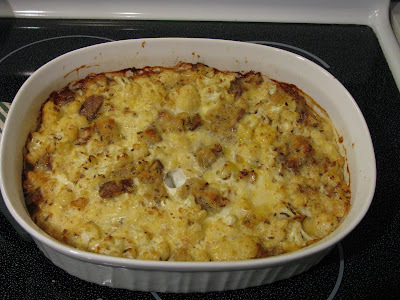 Combine the bread cubes and cauliflower with the grated cheese. Spread the mixture into a greased 3-quart casserole dish. Mix the eggs, mustard, coriander, and black pepper with the beer, and pour the mixture into the casserole dish. Bake at 350 for 45 minutes, until puffed and golden.